I worked for three and a half years as a Retail Key Holder Associate at PetPeople, a locally owned pet supplies store that sells supplies, not pets, and does a lot to support local pet rescue groups. I thought a lot about going to veterinary school but it never felt like quite the right path for me. Then I was reading the blurbs in an ASPCA calendar and was reminded of my interests in Anthrozoology. 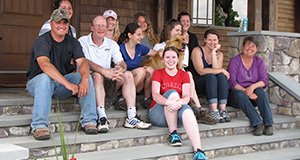 I began looking into programs that offered post-graduate studies in Anthrozoology and that is what brought me to the MAPP web site. After a lot of reading and a very helpful conversation with Dr. Rutberg, I decided to apply. I grew up on a small farm and have cared for all manner of domestic animals over the years, including dogs, cats, chickens, turkeys, goats, ponies, and many others. During high school and college, I worked at the Columbus Zoo and Aquarium as a photographer and media production assistant. After college, I spent time interning at the Jane Goodall Institute where I saw the advocacy side of the animal welfare and environmental conservation movement. 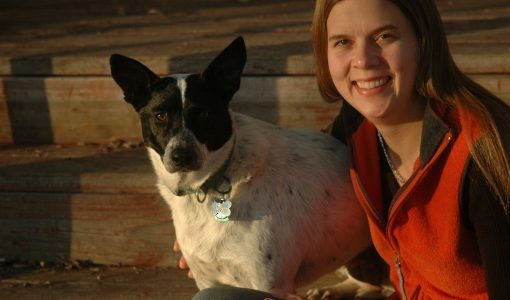 In 2008, I began working at Best Friends Animal Society in Utah as a Dog Caregiver. I spent three and a half years providing all manner of care, compassion, and training to homeless dogs. In 2012, I decided to move back to Ohio to be closer to my family. Then in early 2013, I began working at PetPeople, where I learned a lot about pet nutrition and health, specifically for dogs and cats. I spend most of my free time with my dogs, reading, watching TV, and spending time with my family. I am excited to explore New England some while I am at Tufts’ Cummings School. I have two dogs, Amy and Boomer. I cared for both of them during my time at Best Friends. Amy is an 8-10 year old McNab or McNab mix (best guess). She has been with me since December 1, 2011. Boomer is a 9-11 year old boxer mix who chose me the day he met me, it just took me a while to come around . . . I adopted him on June 7, 2012, the day I left Utah for the three day drive back to Ohio. Amy likes to bark at cars and squirrels, she likes some dogs but not all of them and can be very bossy (typical herding dog) – she thinks that fetch is a terribly offensive activity that should be internationally outlawed. Boomer is a “Momma’s Boy” who is nervous (or downright scared) of most things, including new places, smooth floors, loud noises, most strangers, and children – especially children. In 2013, he had to have his back right leg amputated due to a disseminated Valley Fever infection that had destroyed a section of bone in his leg. He gets around great on his remaining three legs and will have his three-year Ampuversary on September 13th.